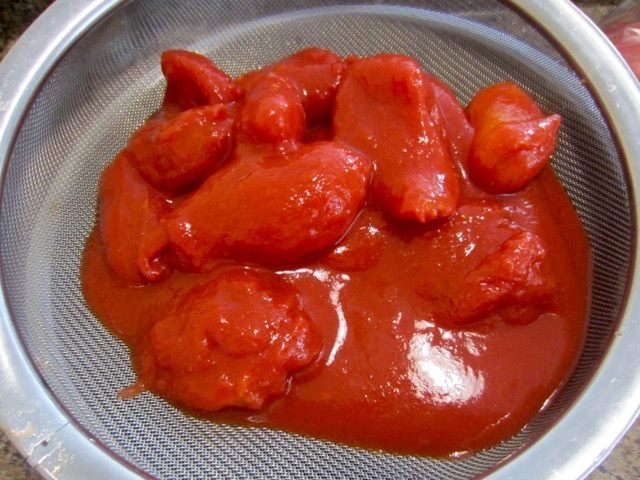 Originally, I used to simmer my pizza sauce for more than an hour to evaporate the water and make it thicker. Now I bake pizza frequently and find it harder and harder to spend time simmering the sauce. I find this sauce more fresh and much more agreeable to my taste. Please make sure you buy the best quality tomatoes. I hope it appeals to you too! Have a great weekend. Drain the tomatoes thoroughly in a colander or strainer with fine mesh, to remove all the liquid. Crush the tomatoes lightly to remove any trapped liquid inside and drain again, thorougly. 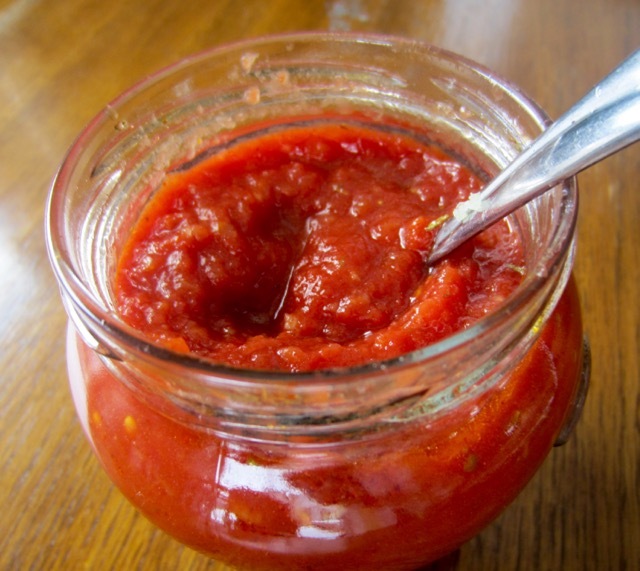 This sauce can also be used as a s simple marinara sauce or to top cannelloni. Drain the tomatoes thoroughly in a colander or strainer with fine mesh, to remove all the liquid. Crush the tomatoes lightly to remove any trapped liquid inside and drain again, thoroughly. Coarsely blend the tomatoes in a blender and stir in salt. Store in a tightly covered container in the fridge for up to one week. (you can add herbs, or pepper if you want). Mine is usually quite spicy….ahem. 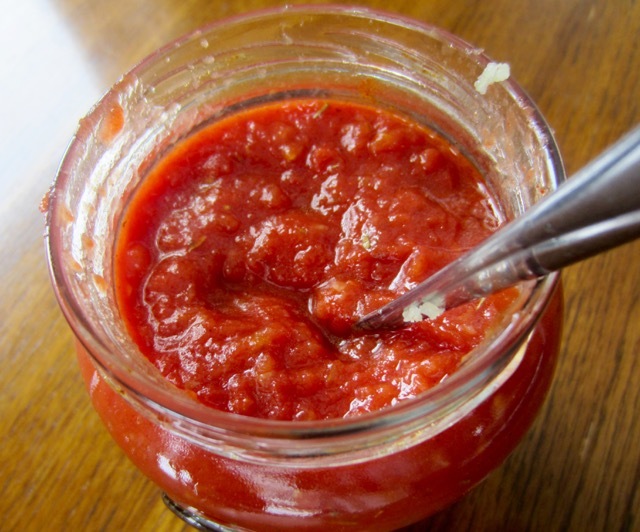 This sauce can also be used as a s simple marinara sauce or sauce to top cannelloni. Prev What are Curry Leaves? Love that you start with whole tomatoes. Yum!! Yes. Whole tomatoes are the key ingredient! Liz do you ever have problems with the sauce having to much acid.. I seem to be acid sensitive and can hardly eat canned tomatoes at all. I eat yellow and orange tomatoes free but unless I add sugar to sauces I find it very hard to eat. 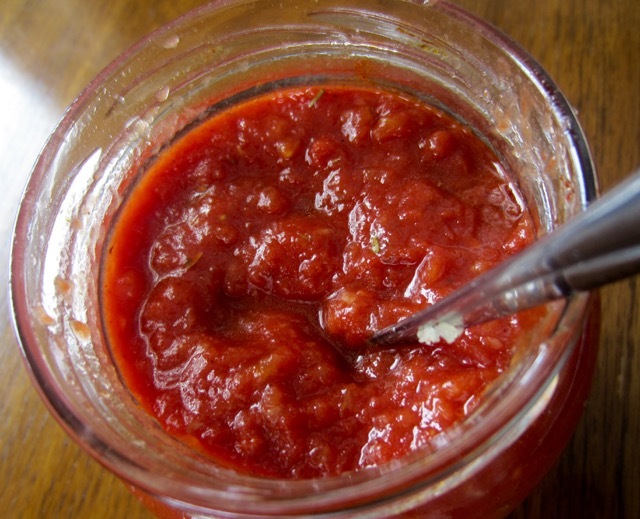 Do you have any other ideas how to reduce the acid in tomato sauces? What brand of canned tomatoes do you buy? I find acid problem with cheap local brands but whenever I buy good quality canned Italian San Marzano Tomatoes, I find them okay. The other thing I found out is the more you cook tomatoes the more sour they become. For example if you skin, seed and blend fresh tomatoes they do not have a lot of acid, but after cooking, the acid taste becomes more pronounced. Sometimes I add sugar but it’s usually just a teaspoon of brown sugar for a 796ml (28oz) can of tomato. You could also add half and half or heavy cream. It helps reduce acidity too. In general 1 teaspoon of brown sugar solves the problem for me, when I am cooking the sauce. In this case I did not add any sugar but it was fine. I hope this helps. Have a great weekend. Thank you for pinning and VERY VERY BELATED NEW YEAR GREETINGS. Have I really talked to you this year??? and where have you been and how is life and how is the yellow farm house and how is the leg (has it healed) and and….oh boy!!!! Hi Liz – jst found your comment. I think we had a quick ‘chat’ in March.. Thanks for remembering about my broken ankle, which was a few years ago. I’m super happy here in St Augustine. Oh yes I do remember you talking about moving. I’m glad you love it there. It must be a pleasantly warm weather. I have just googled. That is the kind of weather I would love every day of my life. Take care and thanks for the chat! Love this! Pizza is one of my quick “go to” weeknight meals. I am experimenting on different kinds of pizza doughs and flours right now, so we are eating tonnes of pizza, every other day. Ha ha. Is there a perfect one? So far it seems it’s the kind of flour you use that make a pizza what it’s. Bread flour is not ideal for pizza. Yes that’s the one I’m talking about. I buy it from my local store but it’s only available in 1kg (2.2Ib) bags. So annoying. But the prices on Amazon are ridiculous. $45 CAD for 1kg (2.2Ib) flour. What in the world is that???? What? Is that for shipping? I Get the Antimo Caputo 00 chefs flour. Pack of 3 for 18.48 free shipping with Amazon prime. How many kilos or pounds is that? I buy a 2.2Ib (1kg) bag for $2.99 CAD so isn’t that way cheaper than what you pay on Amazon? Is there a difference in the different type 00 brands? I have tried three different brands in three different local stores but I didn’t notice any big difference. They probably source them from the same place and package them differently. What is Amazon Prime? I’ve never shopped on Amazon. Oops! Wow! That’s a great deal! I don’t think there is much of a difference. Lol Amazon prime is a paid account kind of like Costco but you get free shipping on most things plus music and movies, grocery delivery and other stuff. It’s great if you frequently shop Amazon. That sounds great but I think some of those Amazon goods are way overpriced. I usually take my time comparing prices and I discovered nothing is really cheap on Amazon or Walmart or even Costco, sometimes. Some things are worth buying, especially if you can’t find it elsewhere but many things are not. Are the movies better than Netflix? We share Netflix and music on Spotify so it works out really cheap per head. Not sure if the movies are better. I took a trip over to Bob’s Red Mill (local grain Mill Co) to see if they had any 00 flour. (they didn’t) but they told me I could use 1 part Pastry flour and 3 parts AP flour. Haven’t had a chance to try it out yet. Have you tried this? Let me know how it turns out if you do. Cheers! It probably won’t be the same because type 00 has lower gluten content an is also very finely ground. It will be ok in terms of gluten content but not in terms of fineness. I’m not sure what the crust will look like. When I get time I shall try and let you know the outcome. Thanks. Have a great weekend, ahead! Have you tried 00 pizza flour? I order Italian pizza flour from Italy through Amazon. Works great. But the experimenting is half the fun! I recently tried type 00 I am never going back to Bread Flour, again. The pizza is crusty on the outside but soft and nice on the inside. Gracious me! !